Who is a Jew? The full answer has always had somewhat blurred edges. Birthright, ethnicity, conversion to Judaism and religious practice have all contributed, but doubt and confusion have persisted for generations. In Israel uncertainty has excluded more than a quarter of million people, who think they are Jewish, from full membership. These are Jews from the former Soviet Union who flooded to Israel in the last century. They arrived thinking they were Jews but found, when they came to get married, or buried in consecrated Jewish soil, that senior rabbis in Israel said they were not. Rivka, whose family emigrated from the former Soviet Union to Israel when she was a small girl, has fallen in love with a young Jewish man and wants to marry him. They approached the synagogue to arrange their marriage and Rivka was horrified to be told by the rabbi that she might not qualify to get married because she was possibly not a Jew. "My mother's Jewish, my grandmother was a Jew, so was my great-grandmother. Who are these people to decide who is a Jew and who is not? Israel, isn't it the home for all the Jews in the world?" Rivka argued. That is certainly the unambiguous message that Israel has sent out, but many people who have moved to their "home" have found that doubt over their Jewish status persists. Rivka has been told that she must either provide comprehensive evidence of her claim to be a Jew, including finding a photograph of her great-grandmother, or she must undergo "full conversion" before she can marry as a Jew. Full conversion will involve living as an orthodox Jew for 18 months. She will have to eat only kosher food, dress modestly and observe the Sabbath in full (no travel, no work, no touching of pens or pencils, even no use of electricity). During last year's election campaign, the political party Israel Beitenu, which derives a lot of its support from Soviet emigres, promised the electorate it would sort out the conversion problem. The Israel Beitenu parliamentarian David Rotem is sponsoring a bill which will allow lower-level rabbis to authorise conversion. He hopes this will "free up" the conversion process. "We have a problem with about 400,000 people who came to Israel who, according to Jewish law, are not Jewish," he says. "They are part of the state of Israel; they join the army, they live here, they contribute to the economy. I am trying to make it easier for them to convert." Israel Beitenu is a member of the ruling coalition and to get the bill through the Knesset it has sought support from ultra-orthodox parties in the alliance. Their condition has been to give the final authority on conversion to the rabbinate, the highest, orthodox Jewish order in the country. If the bill goes through, for the first time legal authority on who is and who is not a Jew will reside with the most senior rabbis in Israel. The rabbinate is understandably delighted, but Rabbi Shear-Yashuv Cohen, the chief Rabbi of Haifa and one of the country's leading religious figures, says that orthodox rabbis have always had the de facto authority to determine who is Jewish. This has horrified the huge and influential Jewish diaspora, particularly Jews living in the US - about half of the Jews in the world - because they see that the implications of this bill are limitless. All Jewish births, marriages and deaths - the right to decide who is Jewish - will reside with a small group of ultra-orthodox rabbis in Israel. 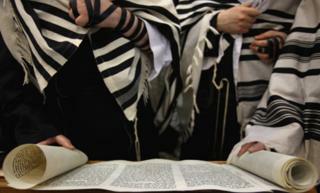 Rabbis in the diaspora will lose their religious authority at the stroke of a pen. Jerry Silverman, the head of the Jewish Federation, which represents Jews in the US, says: "This is a very, very divisive piece of legislation that crosses the line. This is something that we cannot, and will not, sit back and see happen." He and others in the Jewish diaspora are furiously lobbying the Israeli government and warning of the effects that the proposed bill might have. Prime Minister Benjamin Netanyahu has said he is opposed to the legislation and will try to block it, but he relies on the support of Israel Beitenu in the coalition. The point that Jerry Silverman and others make is that when Jews were persecuted, Jews from around the world rallied to give support whether orthodox or not. At a time when Israel needs support from friends, the last thing Israel wants to do is alienate these friends. "This is not the time for us to be in a divided corner, especially in the US. We want to be absolutely supportive of the state of Israel but a bill like this will create some real divides," Mr Silverman says.